I've been remiss in not posting about my meal at In-on Thai last month. It is located next door to Spritz Burger and has only been open for about four months. But there were a couple of real standouts here that merit attention. First, In-on Thai's green curry is the very best I've tried in Chicago. It was just so flavorful, exploding with complexity, and quite spicy. I loved that the fiery heat was not toned down whatsoever, but if you're spice averse, you may want to request the heat be dialed down a notch. 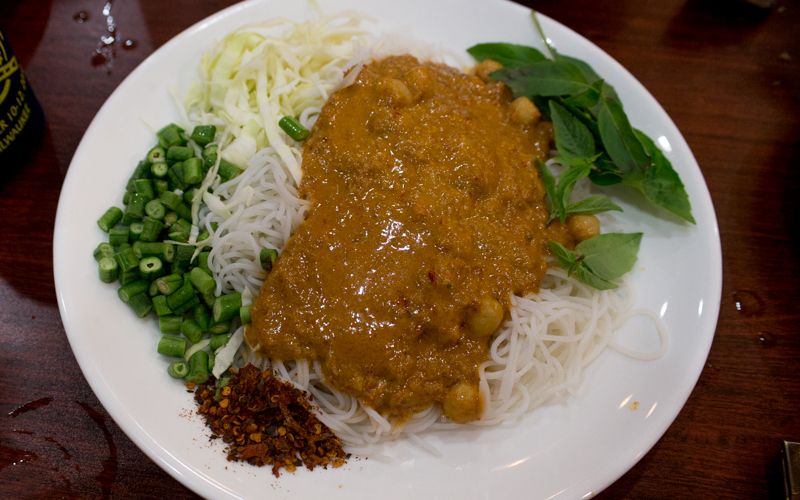 Also, mee krob is a dish that is usually screwed up in the US with too much sweetness. But In-on Thai's reminds me of the mee krob served in clear bags on the streets of Bangkok. There's enough sour (here, from tamarind I believe) to balance the already minimal sweetness. 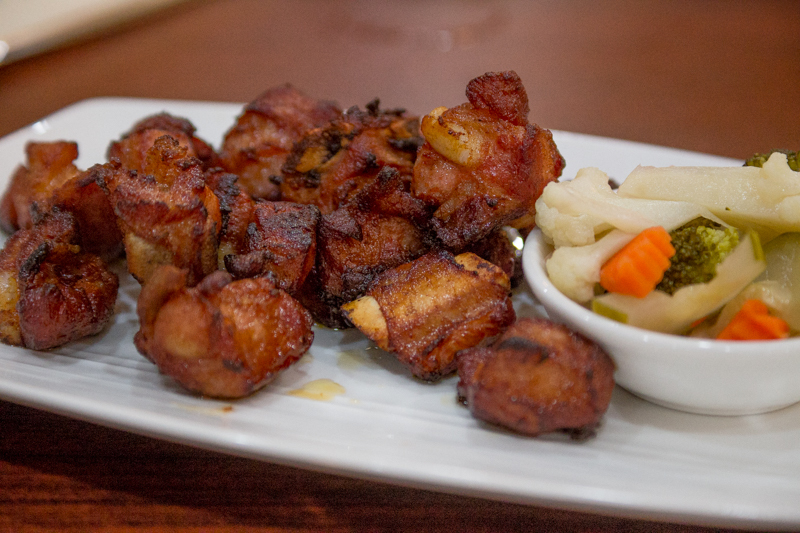 Critically, plenty of chunks of crisp pork. It may be the very best version of this dish I've had in Chicago -- certainly one of the couple best. Not everything was as big a hit though, particularly the seafood curry custard. I was expecting the typical hor mok pla, like you find at Spoon Thai and Rainbow Thai (and occasionally at Aroy, but I don't love their version). But this was not at all like those dishes. It was served in a large aluminum foil packet, and there was no custard whatsoever. And although the general flavors of the dish were right, the seafood chunks in the dish were all terribly overcooked. We tried examining the menu to see if they just delivered the wrong dish, but we couldn't find anything on target. The rest of the menu may be slightly on the short side compared to many of the board favorites, but the chef ran a restaurant in Thailand and apparently excels at noodle dishes and curry pastes according to this article from dnainfo.com. Based upon my experience at In-on Thai, I'd say that the expertise in curry and noodles was very apparent. I look forward to returning and exploring a bit more of the menu. And if anyone would like to try but cares for more ordering power, I'm always game. Huh. I live a five-minute walk away from there, and had no idea it existed. Woah! Another TOP-TIER-THAI to add to my regular rotation! - This was one of the most exciting meals I have had in a long time. I’m frankly shocked that there is only one post on the place (Thanks BR, and sorry I didn’t notice your post earlier). In-On specializes in central Thai cuisine which puts the flavors and dishes in a slightly different category than my other 2 favorite thai places in town, Rainbow or Aroy. That said, in terms of quality, I would certainly place In-On among the big leagues. This Mom, Pop, (+daughter +grandma) place couldn’t be cozier, or friendlier. 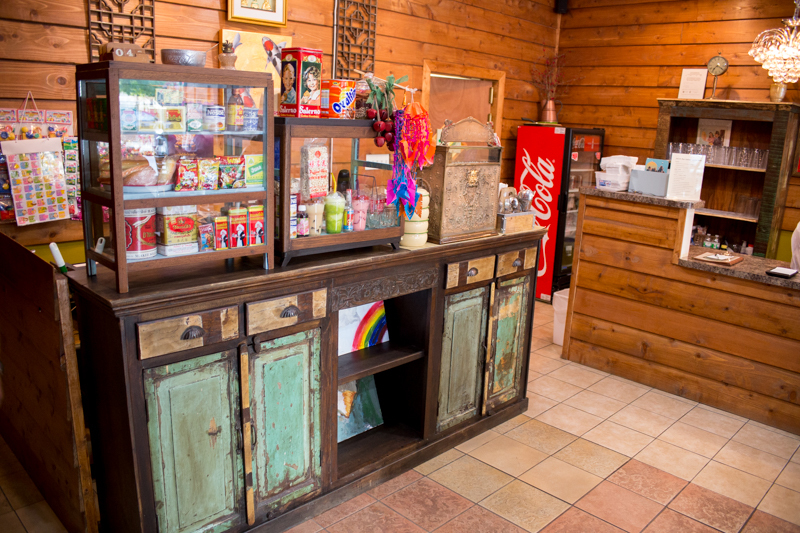 It has a lot of character with the dark wood, wooden furniture, an antique copper cash register which they actually use, and most importantly the artwork from their grade-school daughter all over the walls. The owners were more than happy to curate most of the meal for us when we told them it was our first time in. We let them know that we’re interested in the stuff they’re most proud of, and they were excited to oblige. They explained how they are uncompromising and dedicated to recreating the authentic flavors of central Thailand, with a note of concern that locals don’t necessarily understand those flavors. Considering the neighborhood, it is quite a bold move that they only have one menu, and it does not contain much, if any of the Americanized or Pan-Asian stuff that you find on other menus around town. They delivered on the promise of authenticity with plenty of funk, spice, and deep flavors. 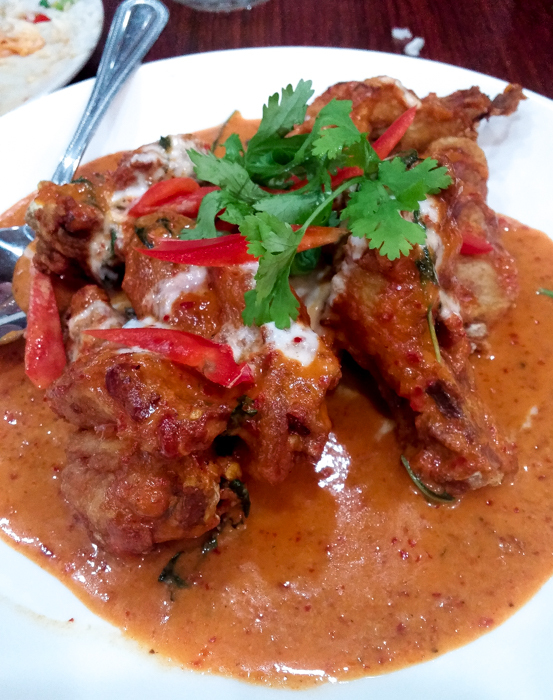 The fact that they make their curries from scratch is certainly nothing to overlook, the quality there is evident and the flavors are the best curry flavors I’ve had in town, but I feel like that is just tip of it. The same level of care is apparent in every dish, curry or not. I’ll start with my favorite, the fermented pork ribs, I believe they are what was listed on the menu as “Marinated Pork Spare Rib”. They had a lot of tang and a bit of funk from the fermentation, but at the same time tasted fresh, juicy, amply seasoned, and served piping hot. Served with a side of pickles, this is probably my new favorite bite at the moment. I am craving them daily. I’m not sure what this noodle curry dish with fish balls was, maybe it was on the board specials, but it was probably tied as my 2nd favorite thing of the day. The curry paste was thick and aggressively spiced, and I don’t mean just hot spicy, I just mean in flavor overload. Once all mixed together it actually reminded me a lot of the Burmese/Thai curries with noodles I’ve had. I really loved the addition of the handmade mini fish balls, smaller than I’ve ever seen. This was a great dish. Equally as awesome was the Green Bean Salad. As you’re probably noticing, the dish titles aren’t exactly descriptive. 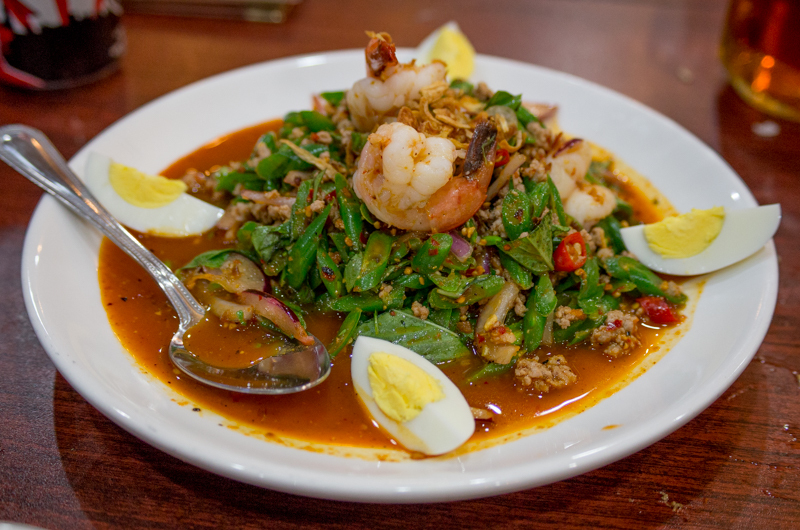 The menu describes it as “Steam green bean, hardboiled egg, shrimp, ground pork on top with coconut milk and crispy shallots.” As you see from the picture, there is a lot more to it than being simply topped with coconut milk. Again, complex spicing, healthy, fresh, vibrant, and intense. 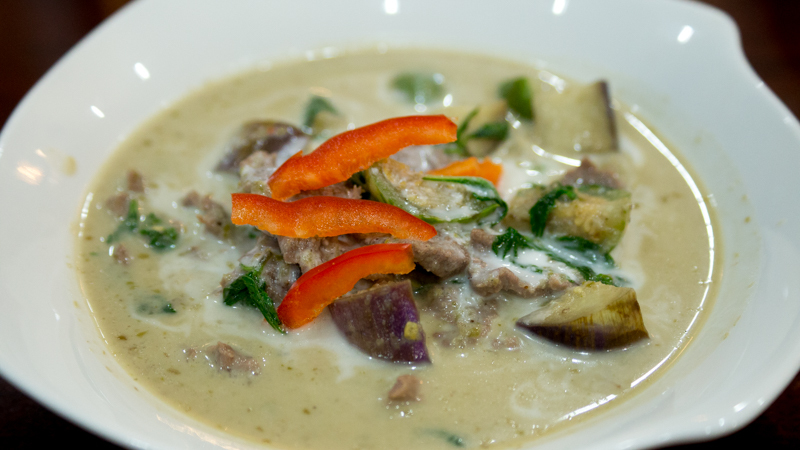 The Green Curry, made from the much talked about homemade curry paste, was different not in its intensity as the other curries, but subtlety is cool too. This was smooth and soothing, which is not to say it was lacking interesting spicing or complexity. Among, if not the best green curry I’ve tasted. Another specials menu item, name unknown, was a crispy fried fish drenched in a curry sauce and topped with crispy fried thai basil. Loved it, would definitely order again. The Mee Krob came highly recommended, by both the owners and by BR. Embarrassed as I am to admit it, I have never had this dish elsewhere, so I am not sure how to place this version. It was just too sweet for me, I’m not often a sweets kind of guy. I was told by BR that the previous version he ate (mentioned in his post above) had more of the tamarind sourness, but he also said, even accounting for that, it was still less sweet than most you’d find in Chicago. I can’t honestly say I’d order it again, but with so many other things on the menu, I’m going to say no huge loss. The Pad Thai is not usually a dish I order, but we were told they do it Bangkok style, and not the american way, so I just had to order it. The noodles had some great char flavor (would it still be called wok hei?) and a great balance of flavors otherwise. The sugar and dried chili peppers were served to the side so you could mix as much as you want into it. It definitely had the requisite sweetness, though it was the least sweet version I’ve had in Chicago, again, balanced. Anyone wanting to taste a decent Pad Thai, I’ll be taking them to In-On. Lastly, another chalkboard special, was what they called a “Curry Puff”, which was like a curry samosa. It had a nice flaky crust and a decent, if a bit mild and mostly potato, interior. Would make for a good appetizer or crowd-pleaser for people with less adventurous palate. This was really an awesome meal! I think In-On deserves a lot more attention, and I'd love to hear what more LTHers think about it as well. With so many more great looking/sounding items on the menu, I look forward to many, many more visits in the future, maybe an LTH get together is in order? Great write up as always Laikom!! And, if you're like me and wanted to immediately order this for dinner, you'll have to wait until tomorrow--they're closed on Wednesdays!! laikom wrote: Woah! Another TOP-TIER-THAI to add to my regular rotation! I had lunch at In-on Thai exactly, oddly, one year ago today and never felt the need to return, until now. Two of us tried four dishes which were not particularly complex and skewed fairly sweet. 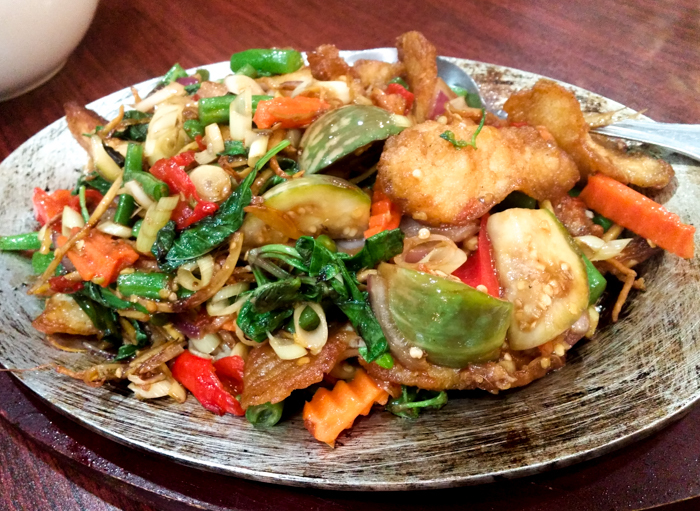 Your lunch looks terrific, happy to have a reason to give In-on Thai another try. Curious, do you remember what you ordered? 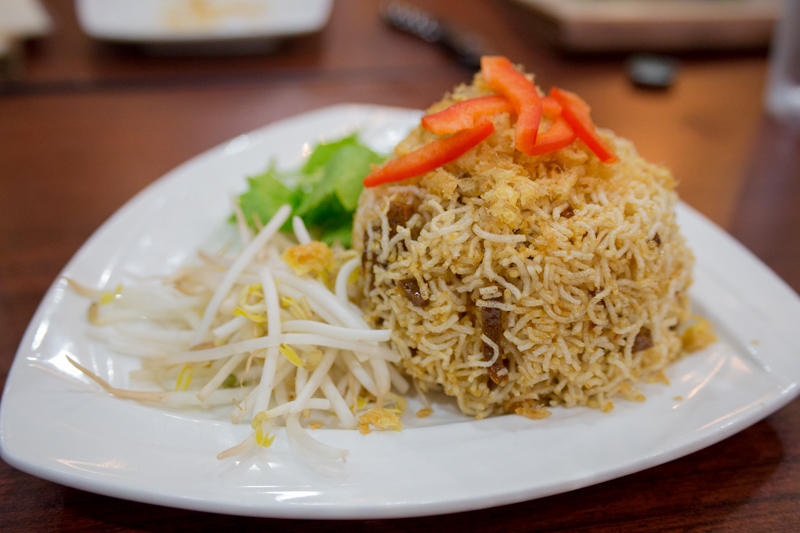 The top 4 dishes did not have any detectable sweetness at all, and all but the Mee Krob were pretty well balanced. And I'm a self proclaimed sugar hater! And In-on Thai shoots right to the top of my Must Eats List. Thank you for the find and the post, BR and laikom. laikom wrote: Curious, do you remember what you ordered? Mostly, but I don't want to dwell in the past, I'll just chalk it up to anomaly and go soon for pork ribs, crispy fried fish, green bean salad and fish with herb salad. Your lunch looked quite tasty. Not a lot more to say other than what Matt said (and beautiful pictures too). This was a fantastic meal and I was glad to finally enjoy a lot of ordering power at In-on Thai, allowing me to try much more of the menu than I had previously tried. I'm not 100% certain, but I believe that the menu has expanded since they first opened. In any event, the crispy fish with herb salad was my absolute favorite dish of the night. The fish was so perfectly crispy, yet also moist, and the herb salad had so much going on in terms of Thai herbs, sour and spice. Green mango added to the sour. Pad Thai has probably been ruined for so many people due to the fact that so many restaurants have ruined it, including by incorporating ketchup. In-on Thai's version is fantastic. The mee krob I described in my initial post was vastly different than the version we were served the other night. The version the other night was not quite sticky enough and lacking fish sauce and sour from either sour orange or lime. It wasn't bad, but it wasn't anywhere close to the magical version I was previously served. Note that if you want the fish ball curry noodle dish, I recall the owner saying he needs around 48 hours notice to make the fish balls, so keep that in mind if you would like the dish. I thought it was excellent, though the fish with herb salad and the crispy fish with the spicy red curry sauce were outstanding too. One other note regarding the green bean salad. If you're not as big a fan of coconut milk, I'll note that I couldn't even taste it in this dish. Regardless, it was excellent, as was the whole meal. Glad to see this thread is finally getting some traction after a year of silence - In-on Thai deserves it. FYI the "sweet" eggplant and pork salad is pretty fiery. I really loved the fish with herbs but she could t eat her dish. 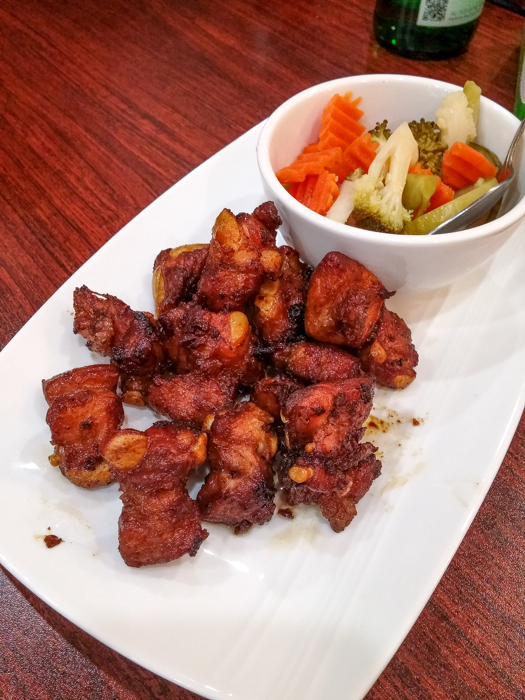 Fermented ribs were stellar, Thai crispy triangles were a little greasy but ok. Black pepper fish was tasty but not as good as the herb preparation. Pad Thai looked good but I didn't get a taste. 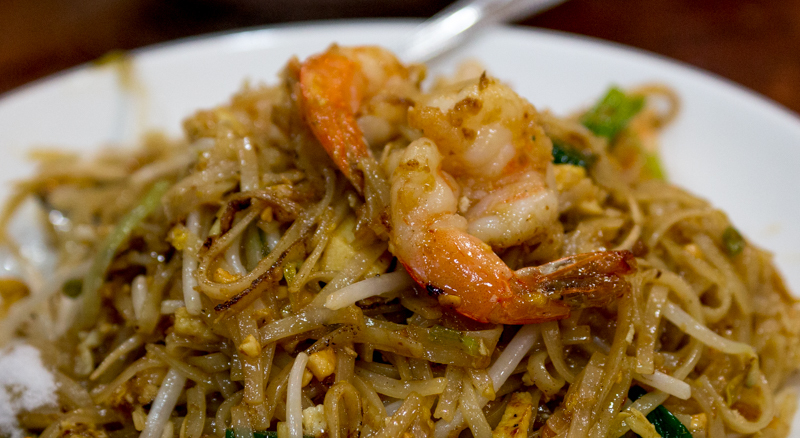 I would rank In-On's pad thai up there with some of the best ones I recently had in Bangkok. It definitely blew away all the other pad thais I've had in Chicago. My favorite was definitely the crispy fish in the curry sauce. It just hit every note perfectly and even drenched in sauce the fish managed to stay crispy. I also loved the fish with herb salad. I really want to try some other fish dishes here since these two were so expertly handled. My only complaint about In-On Thai is the location is even further from me than the Thai joints in Lincoln Square. Thanks to Laikom for gathering folks together last night to explore a bit more of the In-On-Thai menu. This place is legit! Eight of us shared a LOT of wonderful food and service couldn't have been better. Highlights for me started with a special that night---fermented bamboo with chicken on the bone--it wasn't the crazy funky version that Aroy specializes in but was still absolutely delicious--and, along with the pork niblets (which DID bring the funk! ), my favorite dish of the night. Also loved the fried fish with herb salad--lots of brightness and acid along with the perfectly fried fish pieces. Salads are definitely a major strength here--absolutely fiery versions of papaya salad with crab, long bean salad with shrimp and grilled (? so says the menu--was more like a gently pan fried) pork with thin slices of raw thai eggplant were terrific. Even the crab Rangoon, handmade and with what seemed like a bit of turmeric in/on the wonton skin, was outstanding. The owner and his family are lovely and so happy to be cooking for folks who truly appreciate authentic Thai flavors. Can't wait to try more. Dare I say that this visit was even better than the first? Had a great little impromptu dinner last night. Thanks G Wiv, boudreau, petite_gourmande, fropones, mgmcewen, MHL, and Teresa for joining me! Now I called you out, you all better comment if you haven't already! This place is nothing short of glorious. Here are the pics and descriptions from round 2. I forgot my camera, so Teresa took them using her phone. Sorry that a couple are a little blurry, but I didn't want to leave them out. 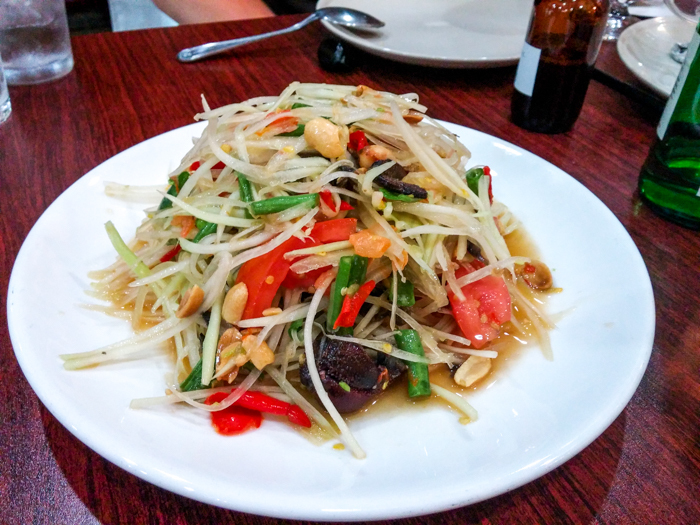 Som Tum Poo (green papaya salad with preserved crabs). I'm still partial to Wanpen's Lao Style Som Tum at Rainbow, but this was excellent as well. 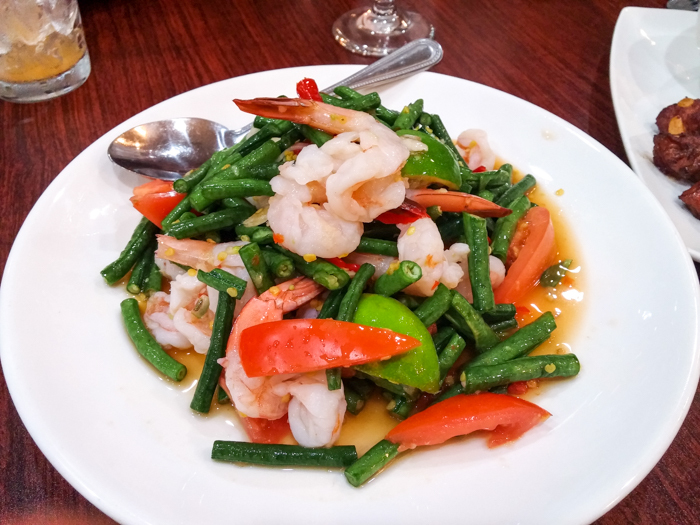 Shrimp with Long Beans. Simple thai salad in theory, but superbly done. I love how great thai chefs know how to ever so lightly poach shrimp. Don't worry, this wasn't blurry in real life. This off menu kitchen special was thinly sliced, very tender fermented bamboo slices were packed into this pickled bamboo curry with bone in chicken. I think (really hope) they can make this if you call ahead of time. The owners asked us a few times if we are sure we all like spicy and stinky things before bringing this out. It was one of the best Thai dishes I have had ever. After the table reported likewise, he told us if we like to eat adventurous next time he will make us a dish with fermented fish stomach. This guy gets me! 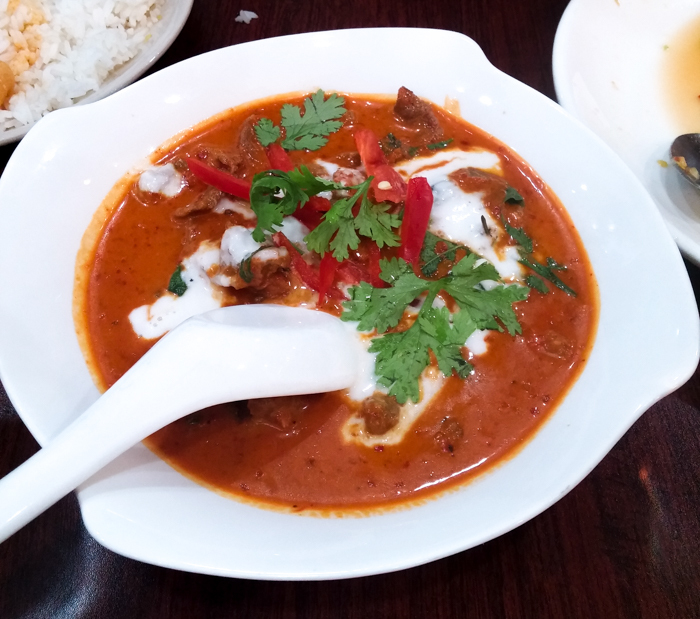 Penang Curry beef. A great rendition of this, probably the best you'll find in Chicago. Great homemade curry paste was the star of the show, as is to be expected. Penang Curry with Crispy Chicken. Same as above, but elevated to another level by the addition of the perfectly crispy fried chicken pieces. I'll have 3 of these to go please! On the menu as Crispy Spicy Salty Shrimp, or something like that, this is another example of the many on the menu of what I can only assume is a bad translation somewhere. There was no crispy, and it was not spicy compared to the other dishes. That is not to say it wasn't good, it was. While not a table favorite, I quite liked it. 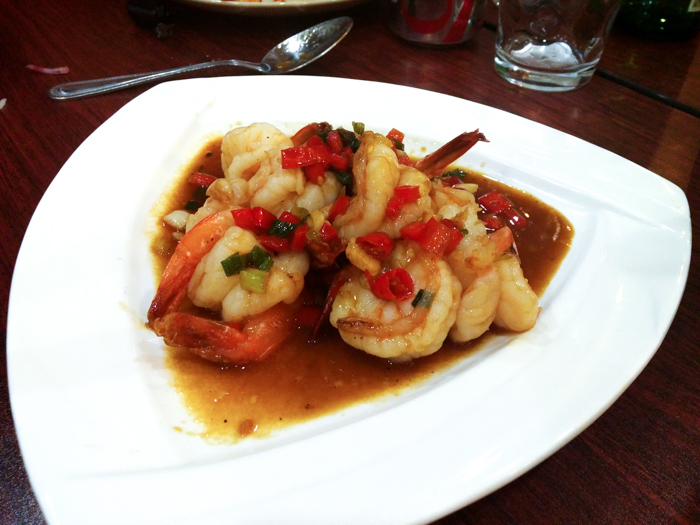 Again, perfectly cooked shrimp, and the mild sauce was a nice subtle palate cleanser between the other firey hot dishes. Just when I thought we had probably reached the heights of the meal a new favorite came out, the Spicy Fish with Young Pepper. I'm not sure why, but the textures, spice and umami in this somehow reminded of a dish you may find at Lao Hunan. Whatever the case, this is another on my must order list. The young peppers weren't all that visible, but the flavor was certainly there, and of course I love it. I'll reiterate what has been said above - these guys know how to fry a piece of white fish to make it taste superb. Another standout dish, picked with an almost random finger point at the menu. The Grilled Pork with Eggplants Salad was awesome. As boudreau mentioned above, the pork was certainly not grilled, yet it had a great texture almost as if it was rare and marinated, very much like a Vietnamese rare beef salad. I'm not claiming this is how it was made, just how it felt/tasted. The raw thin sliced eggplants were crispy fresh and delicious. I think part of the table needed some comfort food after the spice assault of the meal. The Crab Rangoon delivered comfort. Maybe a bit skimpy on the filling, but it tasted as good as they get. I didn't taste the Curry Puffs this time around, maybe we could get some more opinions on them. Last meal we got some brownies after dinner. 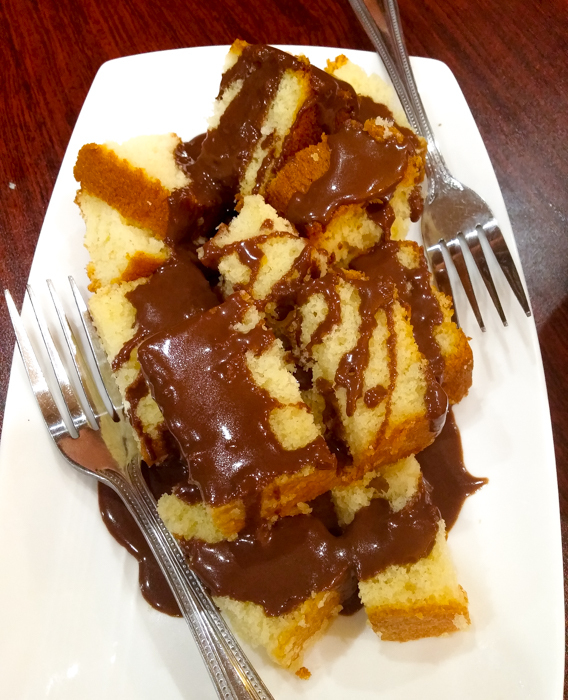 This time we were treated to some Pound Cake with Chocolate Sauce. He told us his wife loves to make American deserts, so that's what we get! It was good. I know it's probably assumed with Thai restaurants, but I don't think anyone has mentioned that In-On is also BYOB. Again the family couldn't have been friendlier, friendly is honestly an understatement, which supports my theory that the best food comes from the nicest people. P.S. 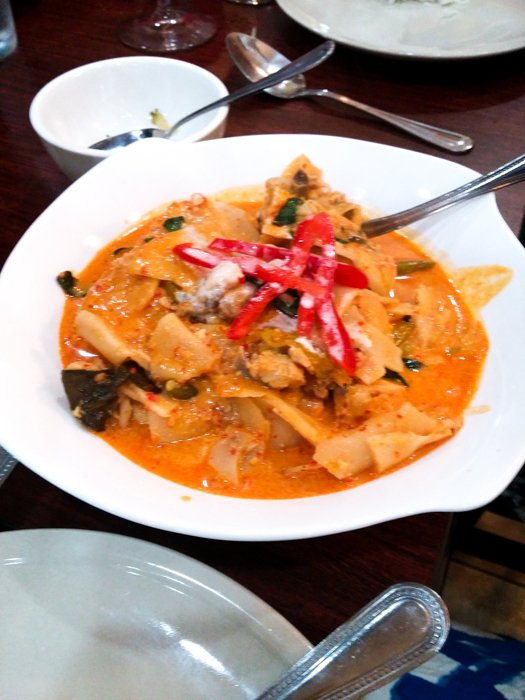 PM me if you're brave enough to join me sometime for some fermented fish guts curry! Boy, is this place comment worthy. Having to choose between this place and Rainbow is like asking which of child is your favorite? I love them both with all my heart and gourmande tummy can devour, equally. The salads and curries were top notch, shoulder to shoulder with the best places and better than most that I visited in Thailand. If it was the afternoon, I think we could have hung out all day snacking on those delicious nibblets of fermented spare ribs, so very addictive. 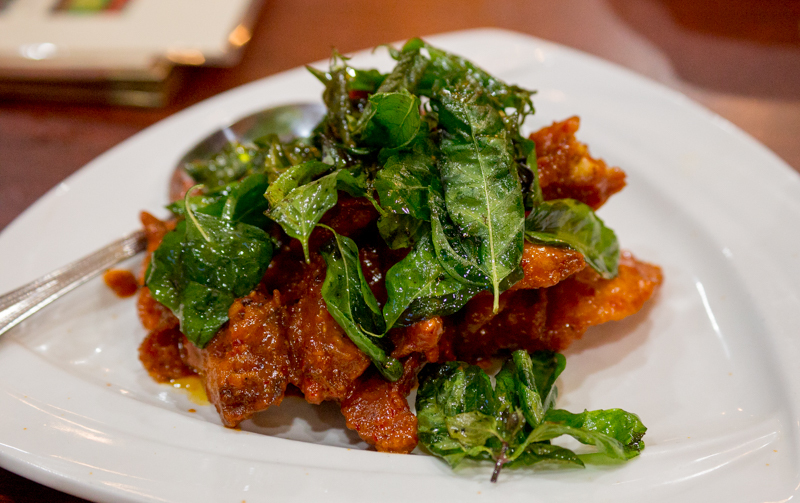 Of course, we should also throw in a couple more orders of the fried wings in Penang sauce for good measure. Seriously, let's just do a second round of everything again real soon, especially, the ribs, wings, bamboo curry, som tum, penang beef curry, eggplant salad, and fish with herb salad. The Pad Thai in the thread above looks great, too, just like the ones at a Bangkok night market, salty and tart unami clinging to every wok-chi'ed strand of noodles, that disappears within 10 secs, necessitating several more rounds of ordering. Thanks, Matt, for organizing the impromptu dinner, and LTH friends for the great company! 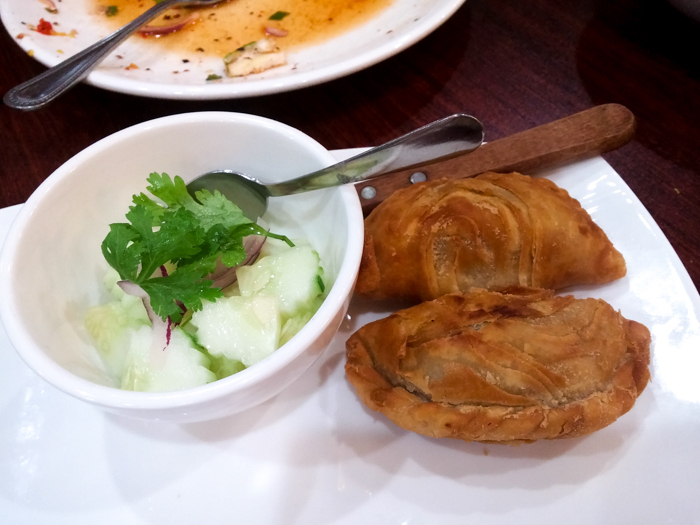 A quick word about the "curry puff": these have been a mainstay of the various Thai groceries here in Chicago over the years, made by the same ladies who supply the prepackaged sweets, naem, and other carry out foods. The late great Thai Grocery at Argyle and Broadway always had them as does PNA in Lincoln Square. Little has been mentioned recently about the curries, sausage and other fresh items at the Thai stores, but they continue to be excellent. No idea if the puffs above are house made or from the mysterious Thai mama who apparently supplies the stores with pastry. 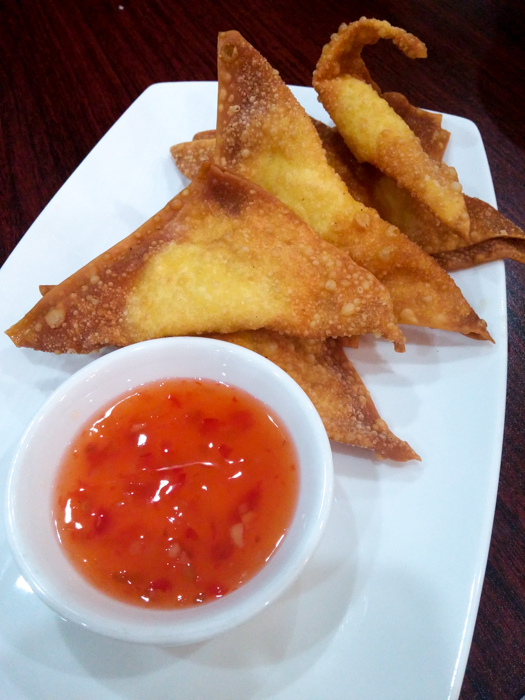 JeffB wrote: A quick word about the "curry puff": these have been a mainstay of the various Thai groceries here in Chicago over the years, made by the same ladies who supply the prepackaged sweets, naem, and other carry out foods. 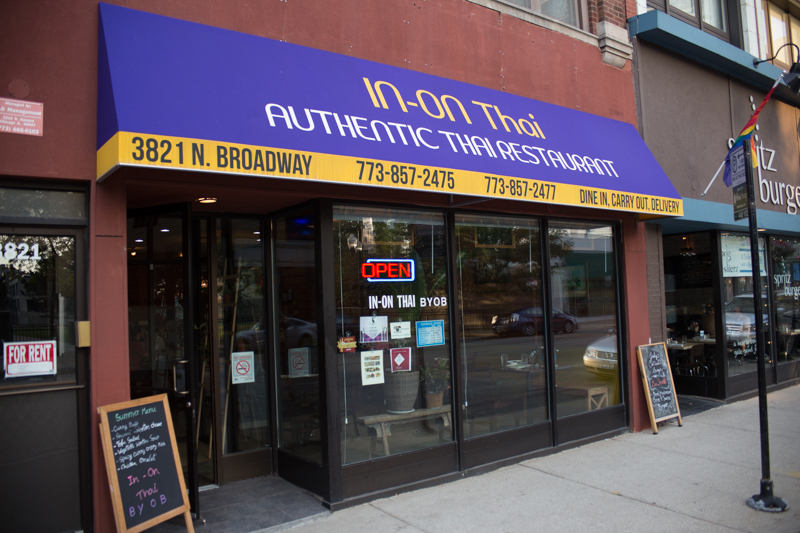 The late great Thai Grocery at Argyle and Broadway always had them as does PNA in Lincoln Square. Little has been mentioned recently about the curries, sausage and other fresh items at the Thai stores, but they continue to be excellent. "I am ordering them from my friend. They are homemade from her mom, but not selling them in any Asian grocery." I was there with another friend for dinner ...and this is definitely a real deal. Also took home Mee Krob - again, homestyle, highly recommended. I knew about this place for a while now, can't believe I waited this long to go and it's only 15mins walk from my house. Curiosity as to how IOT would fare delivered (and a LONG day after which I didn't feel like cooking) got the better of me and we ordered in last night. Happy to say nothing got lost in the process. Fermented pork ribs were still juicy and crispy (and carefully placed in a vented container), as was the fried fish with herb salad--they actually put the fish whole in it's own container to retain maximum crispness. Got to try both the green curry (with shrimp) and the red curry (ordered for the SO with chicken)--both were delicious. SO still prefers Rainbow's red curry and I think I do as well--IOT's was ever so slightly sweeter and definitely thicker--still very good though. So if you're in the delivery area (Lawrence/Ashland (Doang graciously pushed the border the extra block West for me)/Fullerton/the lake) you can count on delicious food packaged properly! Yet another fantastic meal at In-On Thai. Already planning another visit. Have to join the ranks in praising the marinated pork ribs. Not the most tender pieces of pork in the world, but agree with Laikom that these are crave-worthy. We ordered more In-On-Thai two days later to get more of these pleasure nuggets. 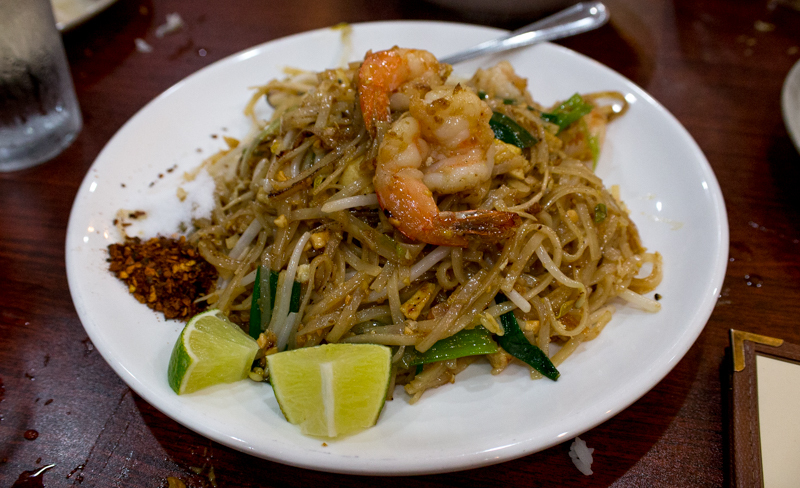 My wife was a big fan of the Pad Thai as well, and she's not one to typically order it at the other Thai restaurants. Delivery was quick and packaged well. Looking forward to trying some of the other dishes posted upthread in the near future. It took me a while to get to In On. I ordered a range of things for delivery. Not much popped out as exceptional, particularly a limp pad Thai that was nothing like the charred beauty above. But, Jesus, the fish curry was possibly the best Thai curry I've ever tasted. And the fish was swell, too. Is it possible that the owners are fibbing when they describe their fish dishes as being tilapia-based? The filet shape and sizes, not to mention the taste, bore little resemblance to the pond rat that I remember, though it's been a long time and maybe the scientists have tweaked tilapia to the point of deliciousness. 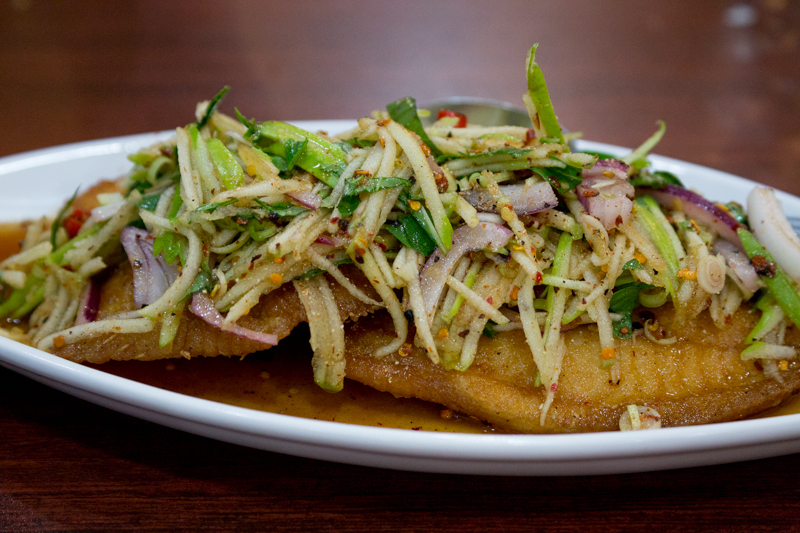 Seemed a lot more like the fish that's often described generically as "sole" in Chinatown and other Asian spots. It would be in keeping with the reverse-secret menu approach identified by Sula and others -- the owners might think that the random Lakeview diner is good with tilapia, a safe place to be, so why complicate things. JeffB wrote: It took me a while to get to In On. I ordered a range of things for delivery. Not much popped out as exceptional, particularly a limp pad Thai that was nothing like the charred beauty above. But, Jesus, the fish curry was possibly the best Thai curry I've ever tasted. And the fish was swell, too. Is it possible that the owners are fibbing when they describe their fish dishes as being tilapia-based? The filet shape and sizes, not to mention the taste, bore little resemblance to the pond rat that I remember, though it's been a long time and maybe the scientists have tweaked tilapia to the point of deliciousness. Seemed a lot more like the fish that's often described generically as "sole" in Chinatown and other Asian spots. It would be in keeping with the reverse-secret menu approach identified by Sula and others -- the owners might think that the random Lakeview diner is good with tilapia, a safe place to be, so why complicate things. Separate visit, same thoughts: no 'wok hai' on the pad thai, which was a little more nuanced than the average Thai-American joint but not noticeably better; however, the green curry was fantastic, and the fish with herb salad even better. Last edited by chezbrad on August 26th, 2015, 8:33 am, edited 1 time in total. Not much to add here other than agreeing that this place is a very good addition to the current Thai rotation. I will second the praise above for the panang curry. It was fantastic. In addition, we ordered baked shrimp with clear noodles. This was a very simple dish of glass noodles and shrimp in a "clay" pot, but it was really outstanding. Given that most of the dishes at our table were pretty spicy, this comforting, bland dish with perfectly cooked shrimp really hit the spot. We were not so enthusiastic about the fried chicken wings. Given the number of really excellent dishes here, I look forward to exploring more of the menu. Can't wait for my next visit. While only one visit in, I wasn't 100% bowled over. There were no absolutely game changing dishes like Rainbow's Naem khao tod nor eye-openers like Aroy's fermented bamboo dish (though I hear there's a fish maw special in the works). I was with a decent sized table, so we were able to work our way around the menu a bit. There was at least one definite misfire in terms of ordering that was on us. Also we were treated to several dishes from the kitchen. And let me start out by saying that in the hospitality department, the owner and his wife are incredibly cool. Starting off with the misfire– we thought we were ordering that insanely delectable looking Panang Curry with Crispy Chicken pictured in post #13. What we ordered was the Thai Style Spicy Chicken from the starters section and received what could be the new Burger King red curry chicken fries. Boneless skinless chicken tenders with only a hint of curry. One dish that I felt did not transcend the Ameri-Thai canon was massaman curry, though I don't believe I've ever had a next level version of the dish. 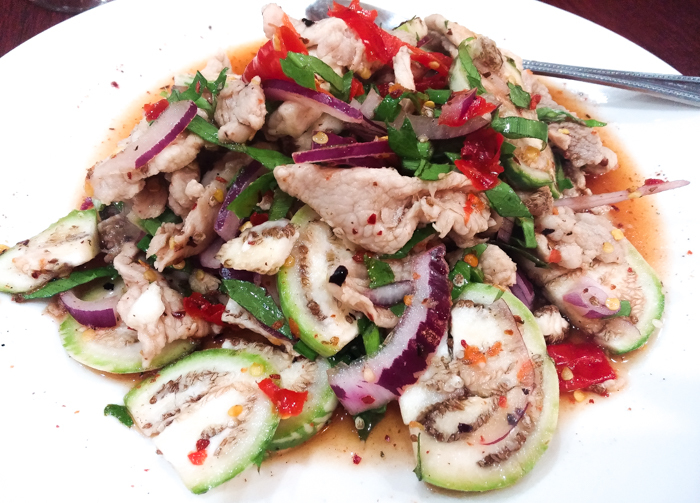 A few dishes weren't bad, but rather plain, like stuff I might whip up at home– an omelet with ground chicken and a comped ground pork stir fry that did pack a mighty bird's eye wallop and featured a fresh type of Thai basil that the owner seemed proud of. Good, but not stand out. The salads were awesome, super fresh, bright, and popping with flavor. The fish with herbs was my favorite dish of the night– so crispy, indeed considerably better than any other tilapia dish around town. Loved the tart apple julienne. I also quite liked the pork and eggplant salad. 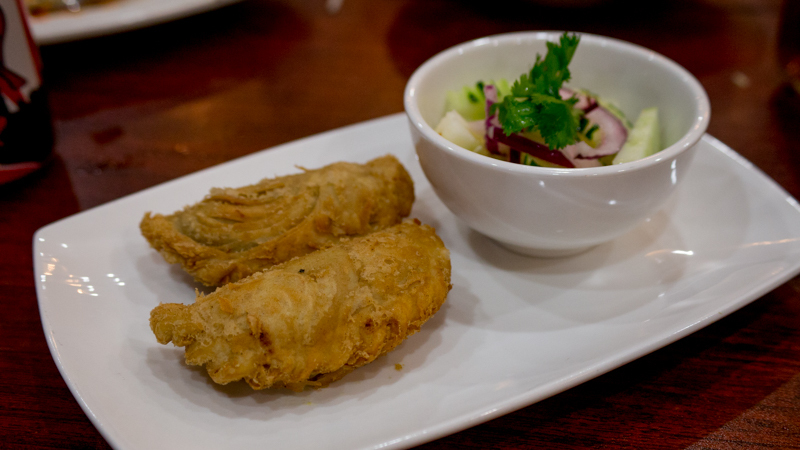 I've never been a big fan of cooked Thai eggplants, so I was pleasantly surprised that I liked them raw so much. Laikom recounts the texture of the pork above as being "almost raw" and this plate had thin slivers of what reminded me almost of shwarma, with crisp edges and a bit of a chew. I liked it, though it was visibly different than whats pictured above. A sleeper was a comped tom yum goong, which had a light stock without tamarind or tomato– brisk, sour, and quite enjoyable with nice little tender shrimps swimming in its awesome broth. Finally, the fermented pork ribs. Addictive, yes. One nit is that the rather plain pickles did not add much for me. I would much prefer a side of pungent nam prik. Perhaps that would not be traditional, though something fiery that could stand up to the sour funk of the pork would be nice. 100% wowed or not, I liked the space, loved the service, and found the ingredients to be impeccably fresh (minus the chicken fries). I know I'll be back as our hive mind hones in on the best of their dishes. Panang curry is certainly a priority for me, especially if its got fried chicken. Went today after reading this thread. It is "real thai" as opposed to "American thai" the we often find. But compared to the competition, I found it average. Mee Krob was so sweet I could only eat a few bites, none of them pleasant. The ground pork larb was good, the curry puffs good. Other than the mee krob, nothing bad, just around "average" for these dishes. Glad I checked it out, but the competition, to me, makes this worthy of a visit only if I happened to be nearby. DutchMuse wrote: Went today after reading this thread. petite_gourmande wrote: The salads and curries were top notch, shoulder to shoulder with the best places and better than most that I visited in Thailand. Jefe wrote: The salads were awesome, super fresh, bright, and popping with flavor. laikom wrote: The Mee Krob came highly recommended... but, it was just too sweet for me. laikom wrote: “Curry Puff”... a bit mild and mostly potato, interior. Would make for a good appetizer or crowd-pleaser for people with less adventurous palate. Fermented pork ribs recommended 10 times. Fish with herb salad recommended 11 times. The menu here is by no means flawless, but what they do well, they do very well. I'm not their spokesperson (okay, maybe I've taken that job on my own accord), but to knock a place that hard after one visit of poor ordering, I just have to speak up. Why is it not possible that DutchMuse read the thread thoroughly, nevertheless ordered what he wanted to order, and had the reaction he had? I'm not saying that's not not a possibility. riddlemay wrote: Why is it not possible that DutchMuse read the thread thoroughly, nevertheless ordered what he wanted to order, and had the reaction he had? I just read the thread about Au Cheval yesterday. I went there and had the General Tso's chicken. It was just OK, and kind of sweet. I won't be going back any time soon. I think the issue may lie in saying that IOT is "real" Thai, not ordering any of the dishes that they specialize in as "real" Thai, ordering the very Ameri-Thai dishes that were pretty well-described as avg., then saying the place isn't good. If you enjoy Ameri-Thai, there's nothing wrong with that. But i don't suggest going to IOT for those dishes.